In a medium bowl, combine and mix eggs, sugar, vegetable oil and vanilla until creamy. In a large bowl, combine flour, baking powder, baking soda, cinnamon and nutmeg. Before adding shredded zucchini, pat dry with a paper towel until most of the moisture is out. Then add zucchini to the mix. Add wet ingredients to dry ingredients. Fold together to combine. Divide batter between two greased 9 x 5-inch loaf pans. Bake at 350°F for one hour or until a toothpick inserted into the center comes out clean. Let cool completely in pan before serving. Ever have a memory induced by smell? Like when the smell of diesel reminds you of being on the school bus as a child? Or the scent of sunscreen reminds you of your favorite summers? For me, it's the aroma of warm, freshly-baked zucchini bread straight from the oven that reminds me of the home where I grew up. It's a comforting memory, sitting on the counter, legs swinging, watching my mom carefully lift the golden brown loaves out from the oven and place them on the countertop next to me to cool. I remember always wanting to immediately take a slice and bite into the green specks of zucchini mixed with sugar, cinnamon and nutmeg. But, as with most things, I had to be patient. It was even tastier if I waited for it to sit overnight, though as a kid, this rarely happened. Now that I'm older and far away from my childhood home, I always bake my mom's zucchini bread when I want that taste (and smell) of comfort. It's every bit as delicious as I remember it, especially now that I have the patience to let it sit in the fridge and allow the flavors to settle and enhance overnight. What's great about this loaf is that it complements your breakfast meal, fills you up as a mid-afternoon snack and suffices as a dessert. It's also an incredibly versatile recipe -- add some raisins or nuts for a little more oomph, or keep it simple (as I usually do). Either way, it's the best way to bring a little nostalgia into my kitchen. 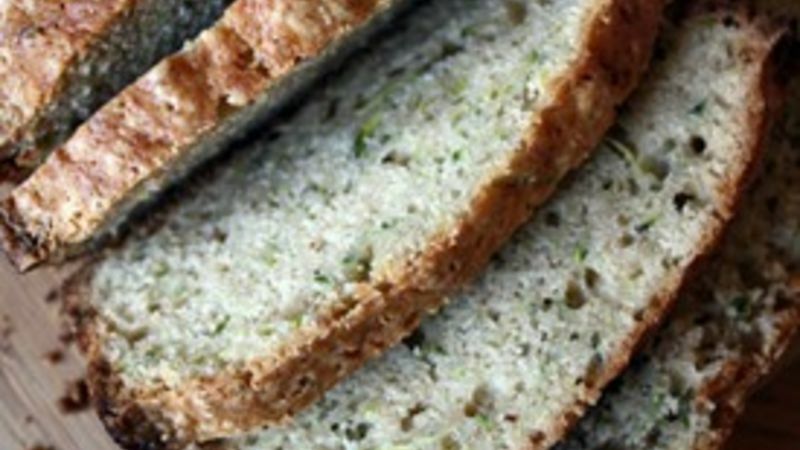 I hope someday I can make new memories with the smell of this loaf, my own kids swinging their legs from the countertop in anticipation of a bite of bread.